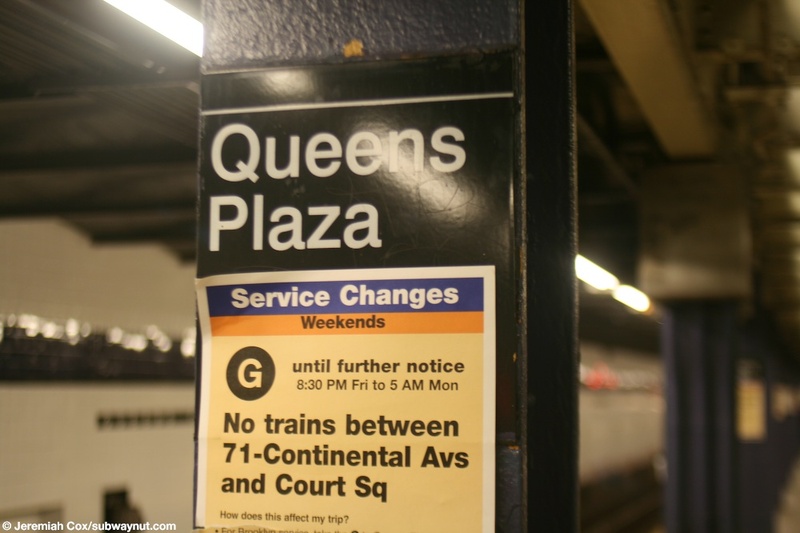 Queens Plaza is the first station on the Queens Blvd line. 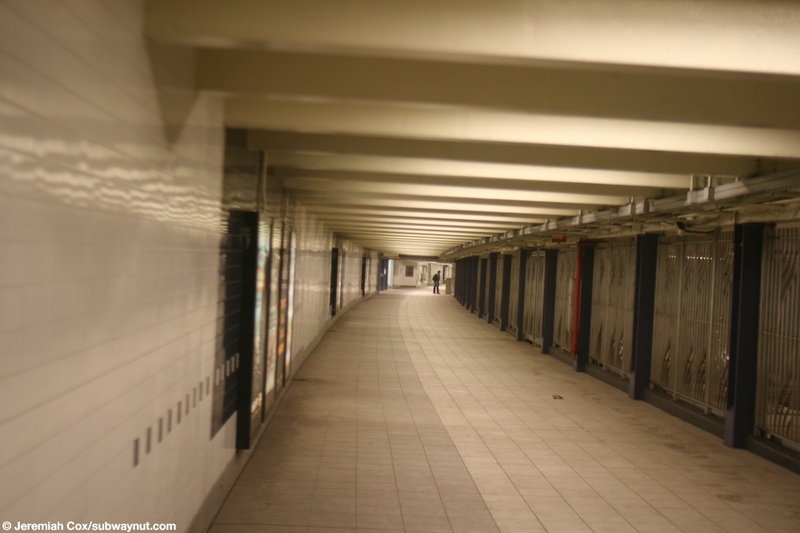 The lines of the E/V, G and R all come together before the station. 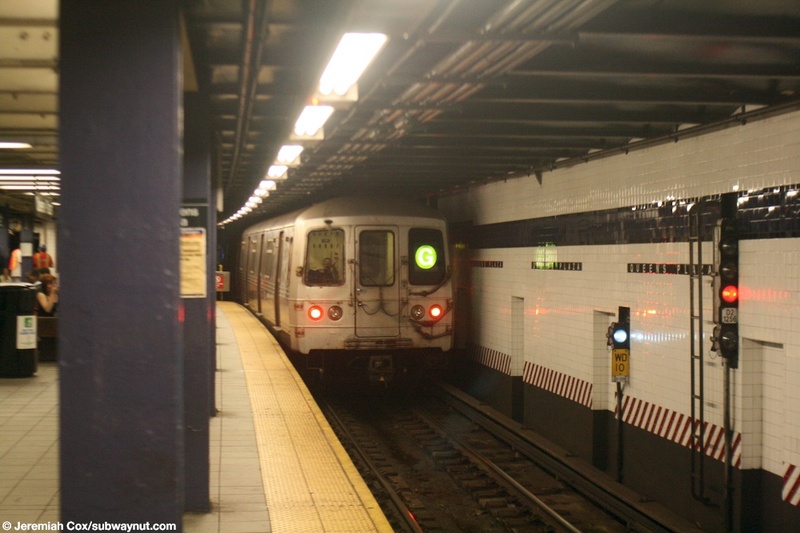 Both the G and R are join up to form the local tracks, the E/V's line become the Express track. 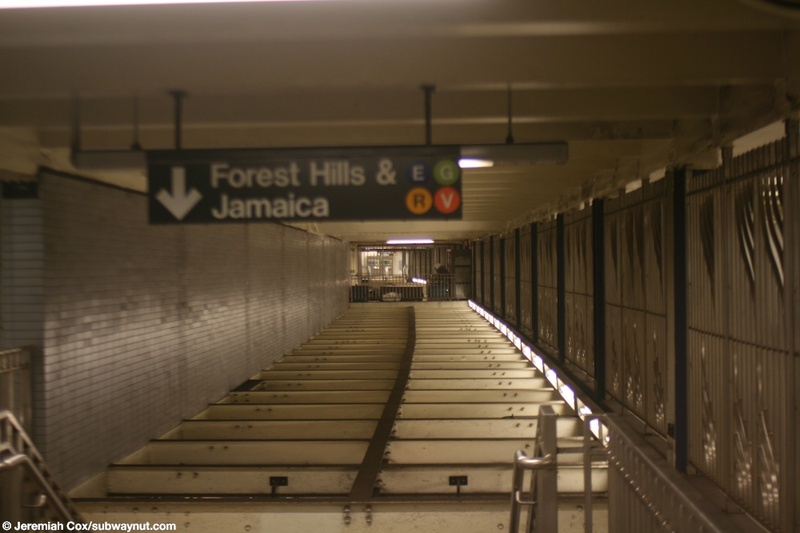 Forest Hills-bound V trains stop on the express track because the regular crossover switch is beyond the platform. Manhattan-bound V trains stop on the local track and then switch over to the E's Express track after the station to rach Manhattan. 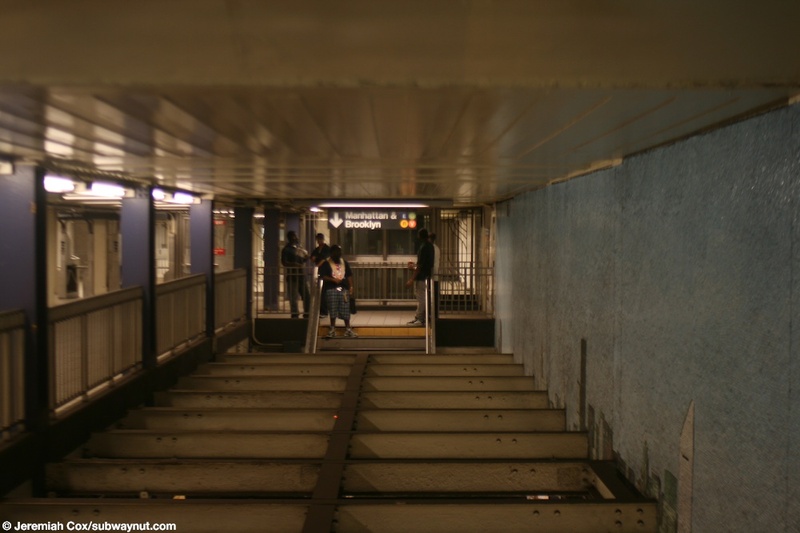 The F and the 63 Street connector use a flying junction (so it can reach either the express or local tracks) beyond the station and before 36th St.
A view down the mezzanine at Queens Plaza as the station is undergoing renovations, it has absolutely no character like it does today. 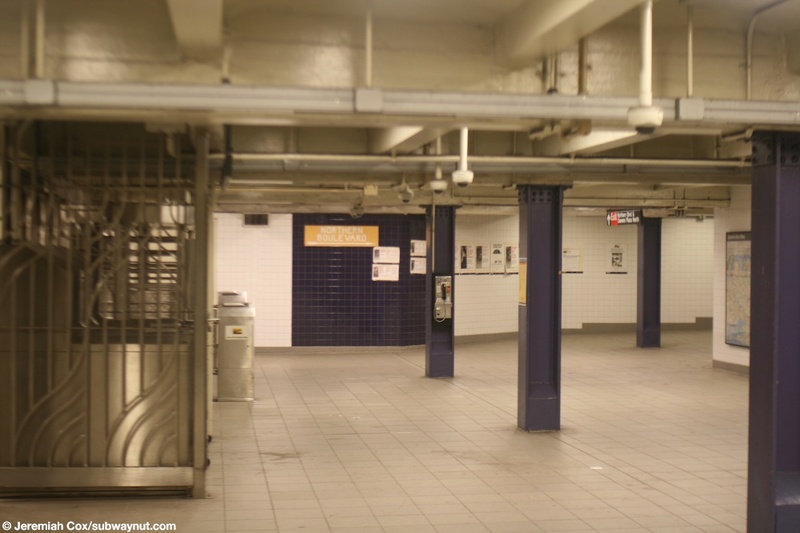 A view of the station at Queens Plaza as renovations are beginning, the tiling along the station walls has yet to be replaced and is still in the original 1930s IND style, not a slight modification of it. 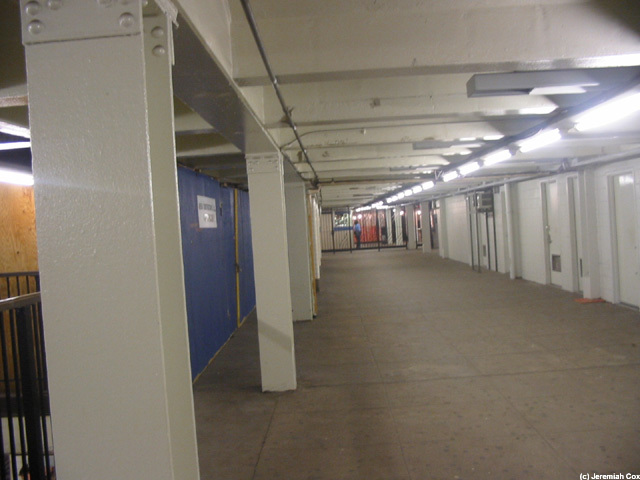 A column sign at Queens Plaza. 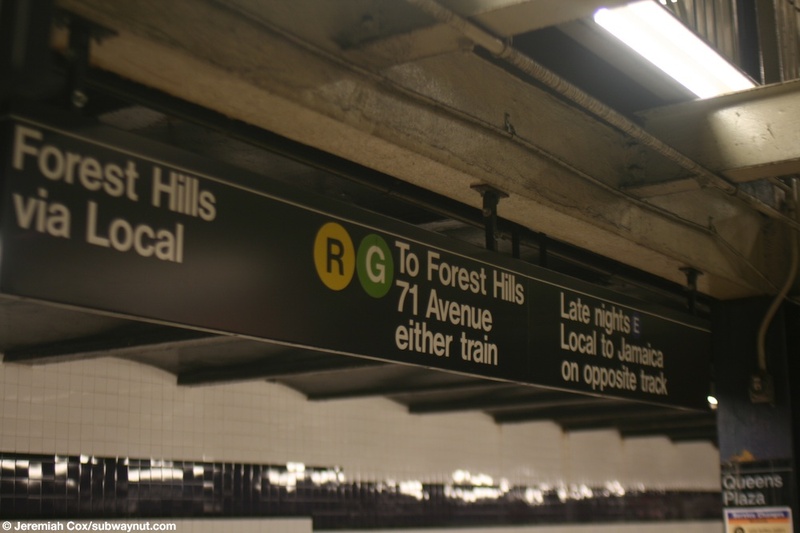 A G train bound for Forest Hills on an evening run leaves Queens Plaza. 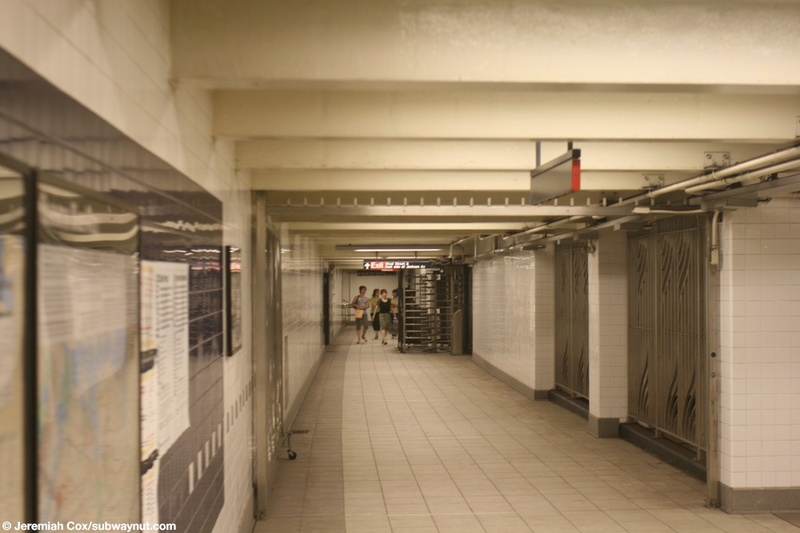 Looking down the Queens-bound platform at Queens Plaza in the renovated station. 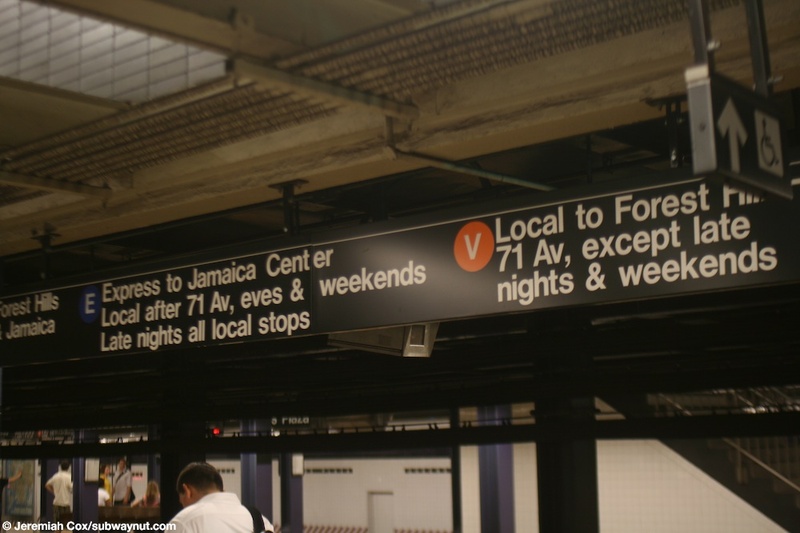 The name sign for the R and G to Forest Hills, with a note saying late nights to take the E local on the opposite track, the V stops there as well. 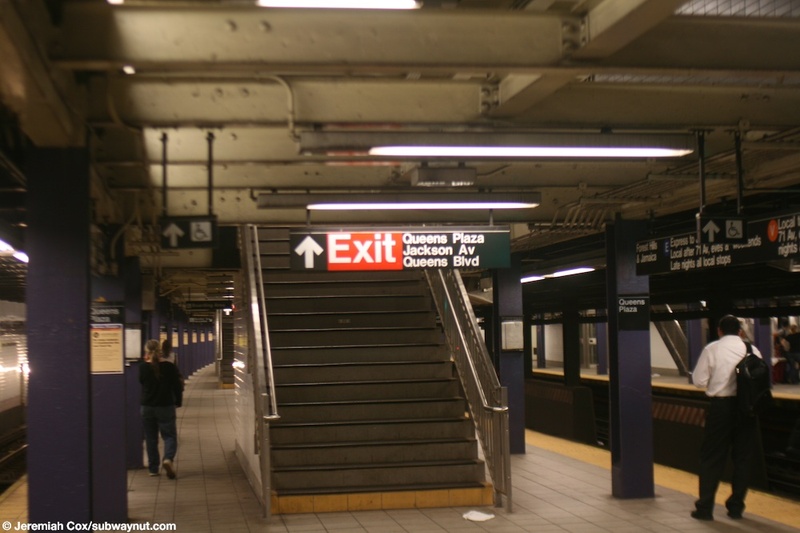 The destination sign on the Express Track for both the E and V.
Looking down a portion of the mezzanine that is exposed to the Queens-bound platform . 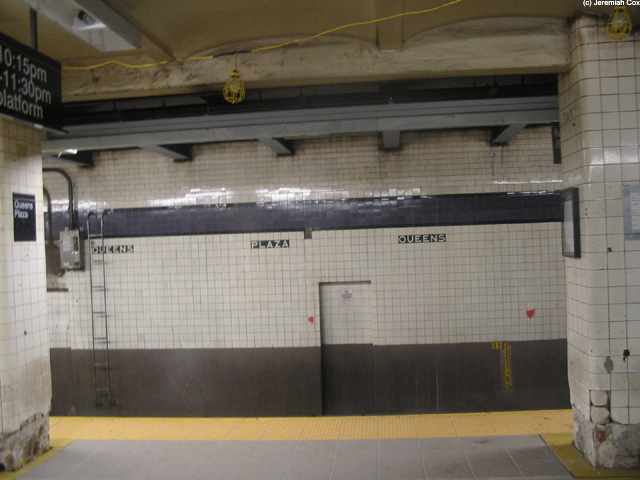 A wall of the mezzanine at Queens Plaza, most of them have mosaics that are part of a very interesting art instillation that is trying to show the skyline above underground. 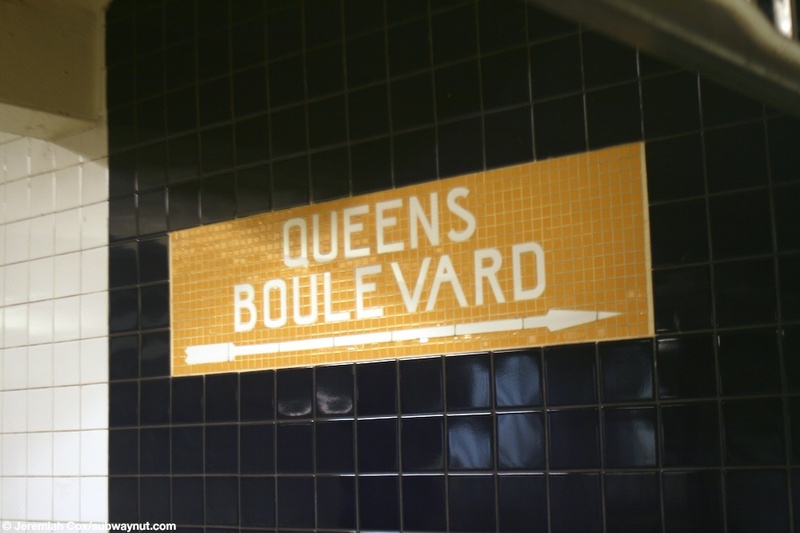 A trying to look retro but in fact a very new exit mosaic for Queens Blvd. 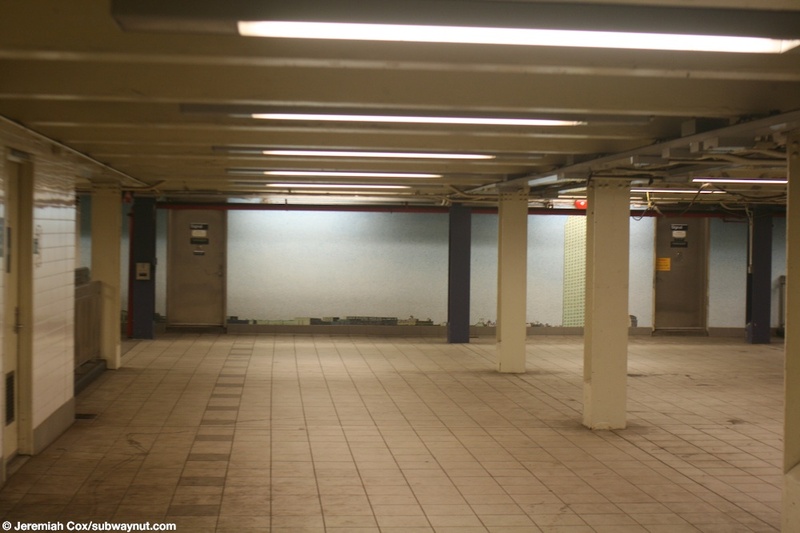 Looking down another portion of the mezzanine at Queens Plaza, here half of it has been left exposed over one of the platforms and the other half just has ads on it and no art. 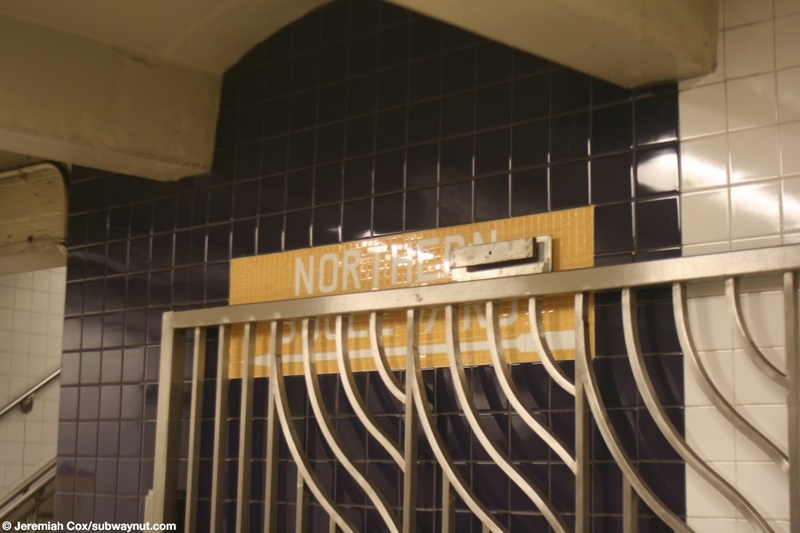 A mosaic for the exit to Northern Blvd with a gate that can close off the exit covering part of the sign. 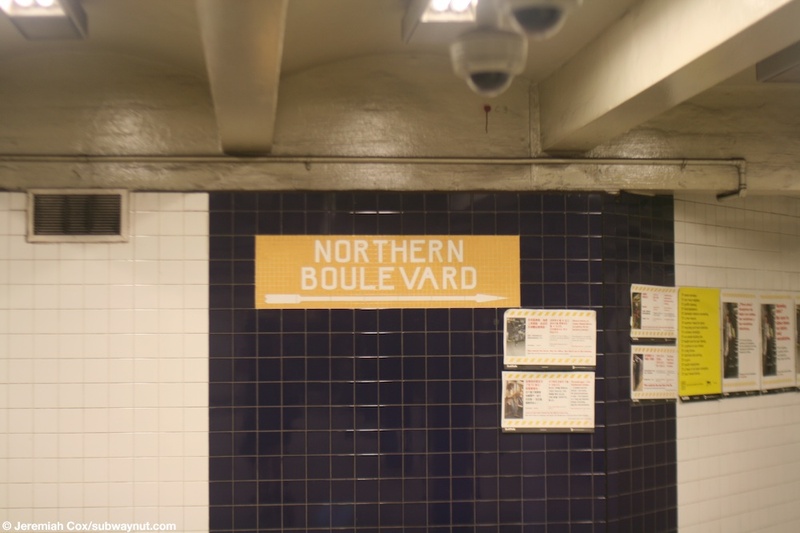 A view of the part time staffed exit to Northern Blvd from outside of fare control. 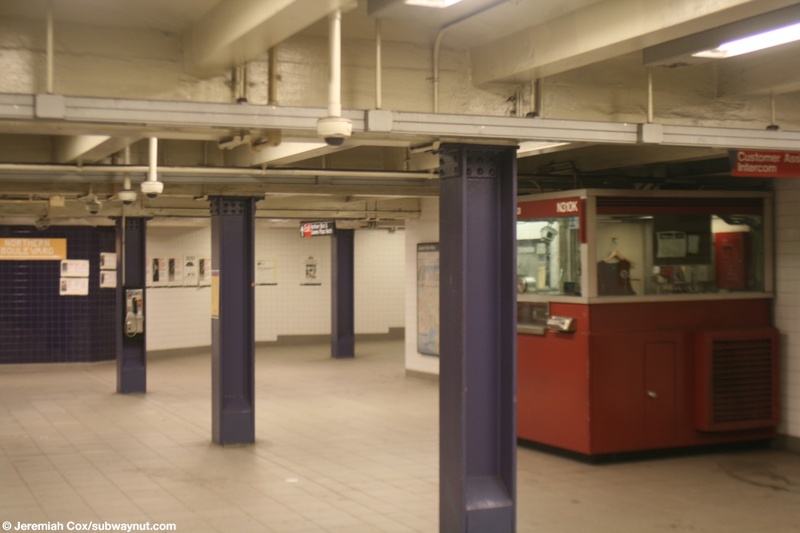 The little red painted token booth, that is now only staffed by a customer service agent who roams the station and can't sell MetroCards. 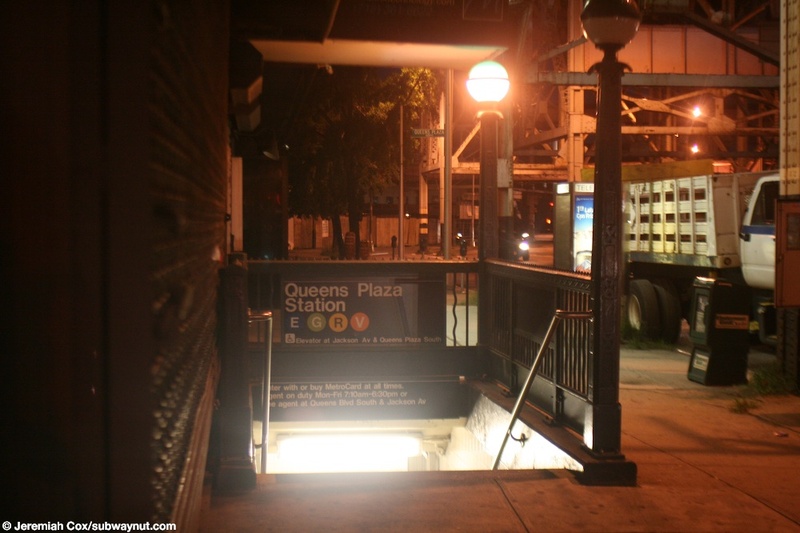 A station entrance to Queens Plaza at night with the elevated structure of the 7 line directly above. 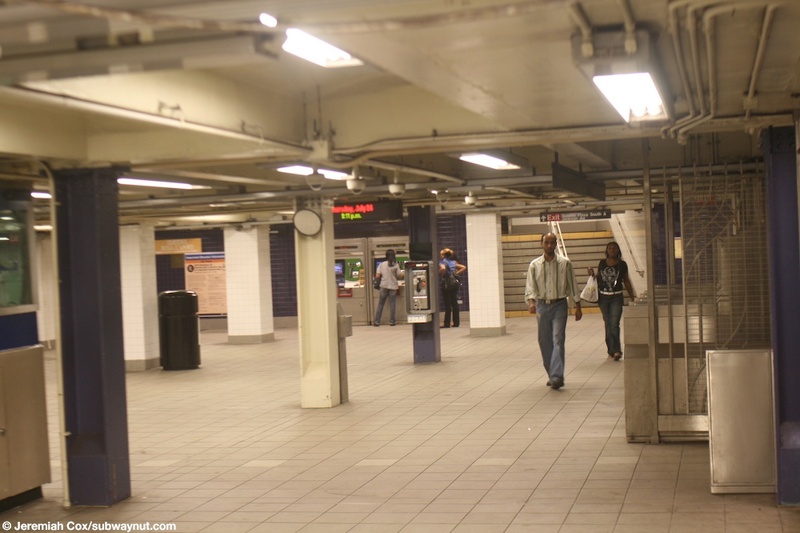 The full time entrance at Queens Plaza to Queens Plaza and Jackson Ave.
A HEET provides a shortcut to the entrance on the East Side of Jackson Avenue, passengers can also walk down this corridor and use the full time entrance. 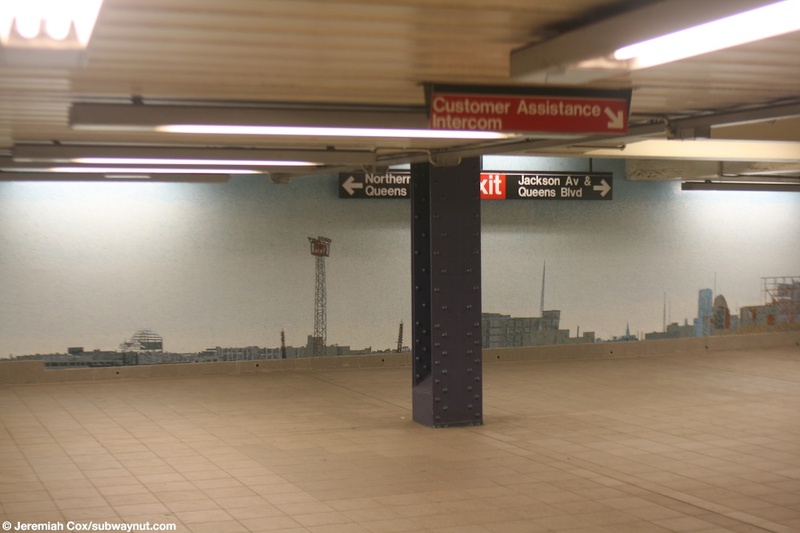 Looking down a portion of the mezzanine at Queens Plaza with the skyline arts for transit mosaic visible.